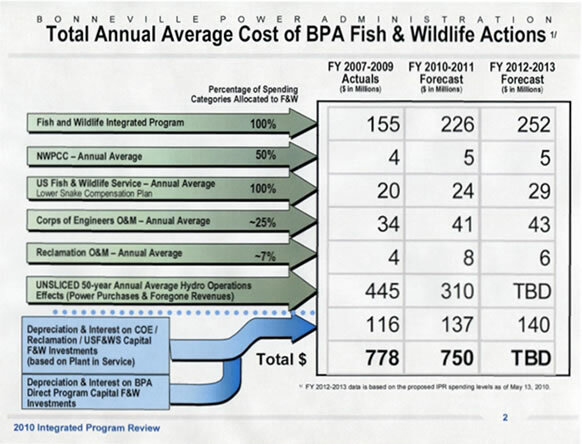 BPA claims nearly $800 million is spent annually to reduce the impacts of the federal hydropower system on fish and wildlife in the Columbia Basin above Bonneville Dam. Some of those expenditures, $200 million, include potentially foregone power revenues because water is spilled at the dams to benefit wild salmon and steelhead. I've always felt that putting a cost on spilling water for fish is strange because it suggests that salmon are not entitled to natural river flows and that BPA owns all of the water to benefit hydropower. By any standard, a lot of money is spent on fish and wildlife mitigation in the Columbia/Snake River Basin, but the return on investment for listed salmon isn't happening. The BPA reports spending $11 billion on fish and wildlife mitigation over the last 30 years. Don't results count? Wild stocks of salmon are not steadily improving and many could face extinction if ocean conditions take a downturn. What is needed is an unbiased analysis of the expenditures and benefits accrued. Federal spending keeps rising with no analysis of wasteful and smart spending. 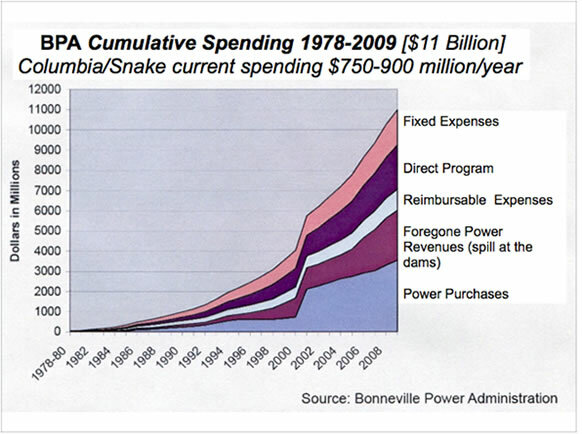 Continuing to fund the preservation of the lower Snake River dams is a perfect example of wasteful spending. Here's one example: The Corps and BPA spend upwards of 0.5 billion dollars a year to maintain the Snake River dams and reservoirs, operate salmon hatcheries, repair habitat in the Snake River Basin and service the debt on the dams. Here's another example: Taxpayers heavily subsidize the 40 to 50-year-old navigation system on the Snake. The future viability of navigation will require a huge infusion of either federal money and/or user fees. Industrial interests who barge goods pay a diesel fuel tax that doesn't cover the cost of maintaining the viability of the waterway. Navigators have offered to pay a small increase in the diesel fuel tax, but not nearly enough. The Obama administration had proposed a lockage fee that would add substantially to revenues for the infrastructure need. The Office of Management and Budget (OMB) at the White House is currently working on proposals that would require commercial navigation pay substantially more - possibly a ton-mile levy on waterborne commerce to replace the fuel tax. 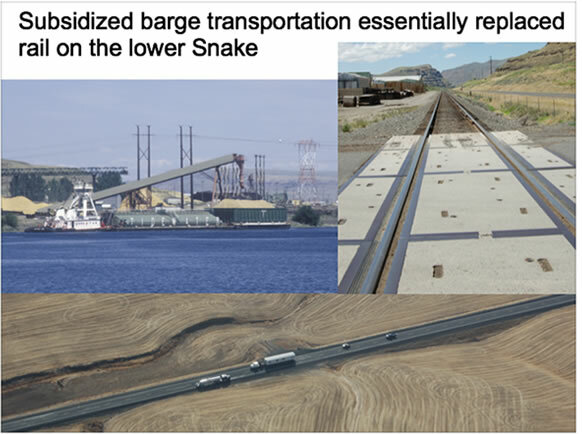 Before the lower Snake dams were completed in 1975 commodities moved by rail and truck. Subsidized navigation undercut shipping rates and essentially put rail out of business for moving goods along the river. If the dams are removed navigation will be gone in the Snake. It will be indispensable that navigation infrastructure in the lower Columbia stay viable which will require adequate investment. Increased user fees will be necessary to keep the waterway whole.